Well, posting tonight seems a bit laborious. The connection to the blogspot website seems tediously slow. It is amazing how impatient faster computers can make a person feel. Today was kind of a slow start. I took Matt with on visits to TR today. We spent the whole afternoon there. When we were at Mavis' place, her daughter Rene stopped in. Matt began making plans with her to go on the May 1 sucker run near Kellior. Some of the readers might wonder what a sucker run is. It's when the sucker fish are spawning and they swim up the creeks. Suckers are a rough fish here, so you can catch quite a large number. Why do that? Because Mavis and Rene have the best pickled fish recipe there ever was invented. Our family loves it. And if we catch a lot of suckers, we can have a lot of pickled sucker that tastes great. Let's put it this way, Rene gave us a pint jar a couple of weeks ago. We opened it up for supper one evening, and it didn't make it all the way around the table before it was gone. Well, let's switch from suckers to something much better. This evening we celebrated God's gift to us of our daughter Elsie. At her request we had macaroni and cheese. Mary made it gluten free, and man, was it good. I made a stir-fry with chicken breast, marin, and 5 spice with mixed vegetables. It was all very good. Her cake was gluten free and had a huge lady-bug on the top. Stella, Sophie, and John tried helping her to blow out the candles. Even so, she missed one. So, some young man, somewhere, according to the superstition, will have to be willing to make a life with Elsie as his bride. At least we have a few years where we don't have to worry about that. Mary told me to not post any pictures where she is visible. She didn't want anyone to see her in her lounging clothes. 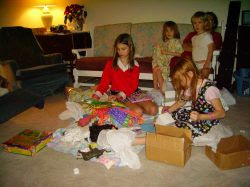 But, anyway, Elsie was very excited to open all the gifts from her family and friends. Grandpa A called to wish her a happy birthday. As soon as she got the phone she disappeared and had a long talk with him. I'm so glad that the kids get on so well with both sets of Grandparents. After the kids were in bed, Mary and I played some piano for each other. She had Mozart's "Turkish March" on her brain from the BBC production of Pride and Prejudice. I had Bach's "Prelude in C" from the "Well Tempered Clavier." We also stumbled through a couple of Chopin preludes and waltzes. Then, I came over to the office to do a bit of reading and post this. Also, just because I find it interesting, we now have a reader in Santiago, Chile; another in Federal, Argentina; and another in Jordanville, Australia. I put a statistics program on my blogs at blogger.com. And I am amazed at the many different places where this blog is read. I've established this particular blog for family members and the members of my parish. And I am amazed at how far flung the readership of this blog has become. I'll recap events before I tell you who's reading. Friday, Alyssa came in and we finished the calendar for Feb. and got the bulletin done. I had several projects to complete before Saturday. And was able to get them done. There was a correspondance from the Synod President which was the cause of sorrow. I will inform the parish of his decision, and I will ask the parish to keep the president in prayer. Saturday, service at Mt. Olive, confirmation class, and pre-marital counselling for a young couple. I did not meet with my confirmation student that needs private tutoring. Sunday, three services. Nazareth had a meal afterwards with the Ladies' Aid annual meeting. Cheryl, I've tried to sent the hymn information to you via your Arctic Cat address. I don't know if you've received it, but I'll put it at the end of this post. Monday is generally the day I take off. Mary went to the chiropracter to have her neck twisted all around and make popping noises. When she got home she felt better than she has in a while. By the way, for you dads ( or you kids) if you want to freak people out with joint popping noises, take a couple of pieces of macaroni and put them in your mouth. Then tell your friends, "Hey, watch me crack my nose!" Twist your nose and crunch down on the macaroni. Then twist your neck in odd ways and bite down on the macaroni again. Your audience will love being disgusted by the noise and show. OK, my geek-trick is done. Monday eve we had Bible Study at Oak Park. After that I went home for devotion with my family and came back to the office to do my reading. Reading is a very important part of the Pastoral calling. Scripture is the first thing that Pastors should know thoroughly. My confirmands know the meaning of the phrase: repetitio matre studiorum est, "repetition is the mother of study." Repeated rereading of Scripture impresses the Word of God on the memory and in the heart. I like to illustrate the importance of rereading Scripture by the example of small children. Infants learn to walk. But it is not easy for them. They fall repeatedly and continuously. And they get hurt. But something God placed in them makes them desire to get up and try again until they can walk without thinking about it. As they get older it comes more easily. Anyone at any age can trip and fall. But walking, for most, is no longer work, but a thing taken for granted. It is practiced every time one takes a stroll. Bible reading is hard at first, the names of people and places, the odd expressions "His nose burned" put us off at first. But the more we read and force ourselves to become familiar with these names and phrases the more familiar we become with the text. Pretty soon we know the texts. But we can forget if we don't constantly refresh ourselves. Rereading is just like walking in this way. We keep ourselves familiar with what the Bible says, even though we know what it says. We walk in the Way of the Lord with each rereading of the Biblical text. It's a whole lot easier to get up and walk in the Word of forgiveness of Christ if we are constantly walking in that same word every day. Well, that's enough of the sermon illustrations. Here are the hymns, Cheryl. Now, who is reading this blog? I don't know. But here are the locations for the past week. Beijing, China. Bristol, England; Santa Maria, Mexico. If you're from these places, please write to me to let me know who you are and how you found out about this blog. My address is ibnabraham at yahoo dot com (fix this address so it works). Another place on my theological blog (diatheke.blogspot.com) is Lima, Peru. 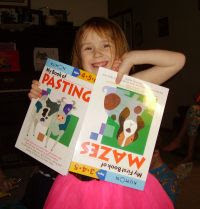 For the family blog, in Washington/Oregon area we have readers in Beaverton, Hood River, Wenatchee, and Golden Dale. For Arizona there is Phoenix and Prescott. There is someone in Bozemann, Montanna. The Midwest is chock full with Des Moines, Scarville, Princeton, Bettendorf, Owatanna, Saginaw, Menominee, Westmont, Rushmore, and lots of places in NW Minnesota and Eastern ND. The hit from Riedsville out on the Atlantic seaboard puzzles me, who are you? Anyway, it's fun to see so many readers each day. There are an average of about 30 readers each day. The original intent, as I said, was for my parish and family. Obviously this has grown quite a bit without my trying. I hope you enjoy the posts here. It does provide a kind of fish-eye view into the life of a parish pastor of four congregations. Anyway, I'll be out most of tomorrow. I put a letter of CFW Wather on the diatheke.blogspot.com site for you Lutherans interested in primary source historical research. I liked it because of Walther's admission "even if I err, I am not a heretic." Any Christian can make a great doctrinal error. A heretic is one who insists on persisting in that error and clinging to it as truth regardless of what Scripture teaches. But we all err. We are sinners. That is who Christ came to redeem. In a parish with one congregation a pastor can be pulled in a lot of directions and not be able to steer a course that does the best for his flock to his own satisfaction. Now, add three. So, Tuesday I spent trying to work on sermon and scheduling for a number of different issues from LYS to Sunday School to Parish Board, to Hymns, to Bible Study. Mary and I also found ourselves pulled in another direction. Wednesday morning I had an emergency call down to MacIntosh. Ray had a fall and may have had a minor stroke. Edwin, Stella, and I went down to see him. If it was a stroke, it didn't take any of his stubborn determination. He kept trying to prove to us how fit he is. But his memory seems to be failing quite a bit. It seems that he can remember things from his youth and adult life fairly well, but things just three minutes past dont hold. He doesn't seem to remember visits from month to month very well. Ray's worst physical injury that we could see was a bad weeping bruise on his left forearm. The three of us spent some time trying to convince him to stay in his wheelchair and to help him remember to do so. Got home for lunch, then off to Wednesday School. After WS a quick supper and a Parish Board Meeting. That went till about 8:45pm. Long Day. Elsie told me the next morning that I was asleep before she was. After TR visits and the Hospital I got home to some more sermon writing/planning/et cetera. Mary did NOT go in the ditch this week, though the kids tried to fool me into believing she did. Hopefully we can finish any calendar stuff tomorrow morning and let the world (well, at least the parish and community) know what we're doing and when. Alyssa, I picked up paper for this weekend, but we'll need to get a box soon. Adeline's funeral was this morning. I found a ream of paper up at the house before I went to bed. So this morning I had plenty of paper for copies. I'll get some more paper tomorrow. Pr. Stafford won't be able to come to our parish board meeting on wed evening, so I think I'll have him give his presentation of recent synodical events at a later date at which I will invite all members. But, for board members, we still have business; our photocopier is one of them. The funeral was packed. Adeline's family occupied almost all of the pews at Nazareth. Overflow was in the dining area. The funeral was standing room only. We have the custom of reading the obituary before the sermon. I apologize to the family members for the names that I mispronounced. Adeline had seven children, 20 grand-children, and 20 great-grandchildren; all named in the obit; plus several others including brothers sisters and others who had died before her. I'm afraid that with such a big list of names my reading became rather sing-song and removed. Such was not my intention. With such a great list, it's hard to keep one's reading voice inflected in a more personal way. I did get one helpful criticism on the sermon. While I did quote Christ saying "I am the way, the truth, and the life. No one comes to the Father but by me;" and while the focus was on Christ as the source and finisher of salvation; the criticism was that I didn't emphasize that Christ is the "only" way while condemning other ways. This is a good criticism to take to heart. I did bring that theme home in the sermon to the public visitation last night. In fact, it was the focus of that sermon. But I should keep in focus that there will be others at the funeral itself who need to hear this just as much as those at the visitation. It was a beautiful day for a funeral. The hoar frost was on the pines in the cemetary. There was a rather unpleasant chill on the wind out there, but the canvass shelter did it's job well. I had to sleep some this afternoon. And now, when I've been working a bit on calendar and hymn selection I'm bone-tired. Tomorrow I have visits in TR. Mary has a Dr. appointment for Stella and herself in Oklee tomorrow. And we've got to get our tax stuff figured out. The van is still in the garage. 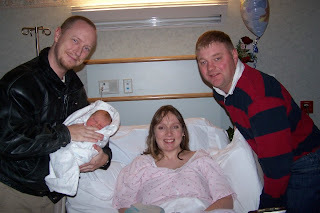 Our friends, Kristi and John, from Denver had a baby boy this weekend. Congratulations! They named him Charles. 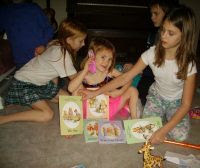 In the middle of a Denver blizzard a new child comes into a loving Christian home. God be praised. Saturday, church at Mt. Olive, Confirmation class. Home. Afternoon, Confirmation class. Evening writing sermons for Adeline's funeral and preparing the worship services: Private devotion for family, public devotion and sermon for visitation, and a sermon for the funeral on Monday. Sunday: Nazareth, Oak Park, St. Petri. Voters' meeting and meal at St. Petri. Mary and the kids came up for the dinner. I went to TR for the private devotion, visitation, and visitation devotion. Home at 6:45 pm. Mildred made some gluten free brownies for me and a GF hotdish. They were both yummy. The brownies were a mix made with rice flour. When she was baking them her husband came in, sniffed the air and asked if she was cooking with rice flour. How did he know? He's a Korean War vet. In Korea he hired a local lady to do his laundry. She used rice starch for pressing his clothes. So, to him, my brownie smelled like fresh pressed shirts. Well, to me it was a gooey and good brownie. Mary got home around 10pm. 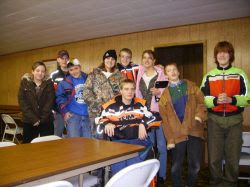 They spent the day at Dawn and Eldon's with their extended family. I'm just finishing up bulletins for the funeral. It's 12:22am and I ran out of paper. 19 copies short on the hymn insert. Oh well. Perhaps I can have the funeral director bring down a ream in the morning. Mary came with me in the morning to sing with me at Adeline's home for the family devotion. We also did some shopping for a birthday girl. 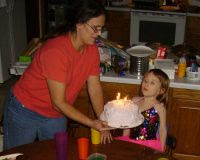 Sophie's first blast of air only got 2 of the 5 candles. Well, you know what that means. Teasing. Naming the boy-friends, and all that. She's dressed up in a sequined ballerina outfit. 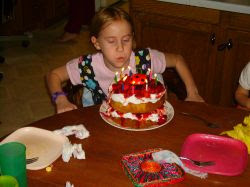 There are other photos of her eating the cake, but I've got enough pictures on this entry. I just hope that I don't accidentally step on one of the new toys in the middle of the night and break it. Sometimes it is an obstacle course here. Char, Dave, Madeline, Henry, Grace, do you recognize these? I suppose it doesn't matter that the Mazes book is upside down. Sometimes that's what you have to do to solve them. But Sophie is ecstatic about the books-as well as the other gifts. She says, "Thank you" to all of you who sent gifts. 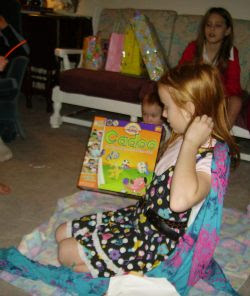 As does Clara, because, we forgot to give her the gift from Mike and Shawna for her birthday on 12/27. She says "Thanks." 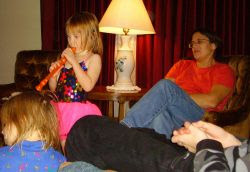 So, after gift opening, Sophie had to entertain us with her new recorder. Actually, she plays it more like a kazoo. She does blow it and make it whistle, while sometimes getting different notes with her fingers. But what matters to her is that she is humming or singing the tune she wants to play at the same time as blowing through the recorder. It tickles me to see this creativitiy. The head is part of a willow branch. The body is a chunk of 1x4 that captured the girls' imagination. The neck, legs, and tail are finishing nails. I like it a lot. I hope we can make it last. It looks almost like an antique on it's first day of existence. Readers will remember that Adeline was diagnosed a week and a half ago with stage 4 cancer throughout her body. She passed away this morning. I went to her house and held devotion with the family gathered around her body. It went very quickly and very peacefully. That is a great blessing. Last week Adeline was telling her daughters, "Don't you cry over me." She didn't want them to worry. She knows her Savior very well. "Sleep" is what she called it, not "death." She has now joined her beloved husband from this life in Heaven awaiting the resurrection of all flesh. I went back to TR this evening for funeral planning with the family and funeral director. The funeral will be a good celebration of her faith. Monday through Thursday were meetings. Winkel, on Monday was at Calvary in Ulen. This photo is of a board in the Ulen cafe. After Winkel I got a ride down to the Twin Cities for a Free Conference. To my great suprise, I had been asked to be one of the pastors chosen to give a reaction to some of the papers presented. The conference itself was exceptionally well attended. In fact, in the week before the conference the registration for attendance had grown so quickly and so great that the organizers had to find a new and bigger location to host the conference. Norman Teigen posted some photos and a summary of the Free conference at his blog. I lectured on Hermeneutics (Biblical Interpretation) at another conference on Wed and attended conference business meetings through Thursday afternoon. I stopped by a friend's place on the way home and got home around 10pm. 13 below this morning. Church at Mt. Olive, voters' meeting, Confirmation Class, afternoon confirmation class, get a paper done for Winkel. The paper I do like this for winkel, pretty much every month, is part of normal weekly sermon preparation anyway. If you're interested it can be found at my wordpress site. Say, I meant to ask, did the Grygla Eagle publish my devotions this month? I was the pastor who was supposed to have January. I sent in 4 articles before Christmas. Somebody up there let me know if they were published, please? If you'd be interested in reading them anyway, they are at the Clearwater Parish website right here. Anyway, I didn't take my vitamin B today and I was a little cranky toward the kids. Sorry, kids. I love you. On Sunday there were two more voters' meetings after services. I could only stay for one. I get to about 6 to 10 voters meetings a year. That's 4 per congregation total (=16). And then there are also between 3 an 8 parish board meetings a year. The number is flexible because we only have meetings when we need things done. 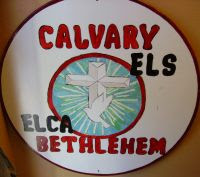 So , now, tomorrow I will have winkel at Calvary in Ulen, Minnesota. After that I'm going to Plymouth, Minnesota to attend a conference. I should be back Thursday evening. So, any blog enteries will be up to Mary during this time. I did take my vitamin B on Sunday. Perhaps I should take some to winkel and the conference, eh? I got my winkel work done as much as I can. I spent some time with Mary, and now, I gotta pack my bags. Oh, and somebody email me if Jill and Aaron have their baby, Please? Oh, and our Mexican readers, tell us how you're doing. I have a migraine today. I didn't realize it til my morning coffee came back. I got in contact with Jeff B over at Clearbrook to get the van towed and worked on. His mom and aunt attend Mt. Olive. I buried his father this past summer. Wonderful man, great family. Most of the day I spent in a dark room with an ice pack on my head. This evening Sylvia called and asked about church at Mt. Olive tomorrow. Our congregations have a 20 below policy. If it's that cold we cancel church. We've too many frail elderly members who would go out. So if it's 20 below or colder at 7:30 tomorrow I'll call Sylvia and the radio station and get the word out. Oh, by the way. The tie rods, upper and lower on both sides are bent on the van. That's as much as I know now. Time to practice my sermon. Thursday I did visits in TR. Ragna looks better. She's in her apartment at Valley Home now. She had another round of chemo yesterday. But she's eating and looking stronger. Adeline is at her house. Her daughters are going to take care of her there for as long as they can. When I got there a lot of family was visiting. She looks pretty good, but she's pretty much confined to bed. They have a special bed in the livingroom for her. Mavis was doing fairly well, but her sister, Ethel, had a couple of heart attacks and went through heart surgery. I got back home, ate a late dinner, went to the office and noticed a white pickup drive up to the house. Somebody dropped off Mary and the kids. "Uh oh," I thought. They had piano lessons in RLF today. Mary and the kids are all ok. Matt has a small bruise on one shin. There was a patch of ice on the road and some strong winds in the afternoon. Looking at the tracks after the ice patch I think Mary did a great job getting the van straightened out. But by then they were at the edge of the ditch. The van is a 1 ton Dodge Ram. A big vehicle. The ditch is twice as deep as the van is tall. Mary was able to avoid a fence post, well, most of the way. It appears to have taken off the passenger side door handle, but not the mirror. Kelly took me out there and we tried to get the van out, but the ditch is too deep and the ice too slick on the road. The ditches around here tend to be very deep and very steep. They are a lot like the drainage ditches down by mom and dad's home. The driver's side front wheel is broken and askew. Perhaps a tie rod broke. I'll call to have it towed tomorrow. I doubt the county is goint to pay Mary for mowing all those cattails. But I did manage to get quite a few of them out of the engine compartment. We're all a bit frazzled by the event, Mary and Sophie most of all. Thank God they are all safe and uninjured. Tuesday was a work in the office day with phone calls and such. My file server broke down. The problem was a bad memory chip. I've got plenty of those and got it working again. Wed, similar office day but we started wed school this week. The kids will have one more examination on the whole of the Small Catechism before confirmation on Palm Sunday. During Wed. school Alison came over to the house and did some painting that Mary wanted to get done. 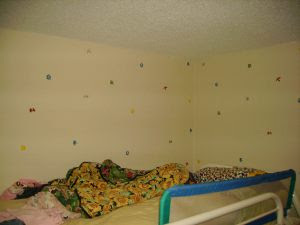 The wall by John's bunk has helicopters, jets, trucks, VWbugs, and such boy stuff. 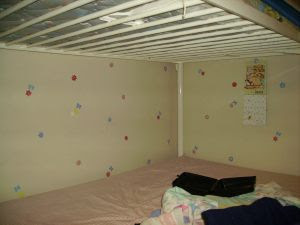 The wall by Sophie and Clara's bunk has flowers and butterflies and cute things that girls like. John had several cars laid out each on its own toy plate this evening. "I put them in their own beds." He said. Louisa and Elsie got John to dance a waltz with Stella. Sorry, I didn't get a pic of that. Maybe they'll do it again when I have the camera up at the house. Monday was mostly a day off. I spent some time trimming my bow. Remember that the bow is a 2" ash sapling. So I have to work with and around the knots. That's why the top limb is bent back funny. It's also why there is a swell at the front of the top limb by the handle. And, I know, the proportions are odd. The lower limb is shorter than the top. I'm new to this. I thought, maybe putting the arrow rest at the middle of the bow would be a good idea. Who knows? Anyway the bow is now ready for tillering. That will be a bit of a process. I was late for Bible Study this evening. Not because of the bow, but because I am a forgetful dufus. Bible Study at St. Petri this evening, and at Mt. Olive Yesterday. Both on the texts from Abraham to Isaac, preparing for the sojourn in Egypt and the Exodus. Services yesterday and today at all 4 churches. It was a bit icy going to St. Petri this morning. In the evening we had youth group meeting (LYS) at St. Petri. We had a good crowd. We did a little Bible History quiz and read through the first three chapters of Judges for devotion. The meeting went very nicely. Hopefully the kids will be skiing next weekend at Bemidji. We arrived home safely on the evening of Jan 1st. Jeremy had school starting the 2nd. Right away I got busy with hospital calls. There was some run-around trying to locate some people this week. Ragna is in TR now. I finally have the correct location. Adeline was in Fargo, she had been in TR but was transferred. Saturday I was able to get to Fargo and see Adeline. Adeline had diverticulitis before Christmas. She then was diagnosed with a bad vertabrae and went in for a fusion the first week of Jan. During the surgery they discovered bone cancer. After some exploration they found out she had cancer throughout her abdomen and colon. She's not a candidate for chemo. The doctors have given her 3 to 6 months to live. We had devotion and Lord's Supper on the Epiphany Gospel. Her daughters were able to be with her in the hospital. Hopefully she'll be able to go to TR this coming week.